It was a whirlwind trip, mostly driving with very little in the way of stopping to take pictures. But taking pictures wasn’t really what it was about, anyway. It was about giving my older brother an opportunity to get out of Houston and see a bit of west Texas that he’d always wanted to see. Neither he nor his old truck are in any condition to drive out there alone, so I suggested the trip and volunteered to drive. I rented a car for the trip so my wife, who stayed home for this trip, would have transportation…she has no interest in driving my old beater pickup. I arranged to rent a mid-size car from Enterprise, but when I went to pick it up on Monday morning, it looked a bit small, so I upgraded to a full-size Dodge Charger, a black beast designed to look angry and dangerous. The agent gave me the keys and I went out and got in to find the car had not been washed and the windshield was a mess of bug splatter and streaks. I asked for a wet rag to get the windshield clean but, instead, they insisted on washing it…”it will take just 10 minutes.” Thirty-five minutes later, they pulled the car around, cleaner than it had been, but still with streaks on the windshield and, now, water all over the car. I shook my head in astonishment and drove home. Once I’d packed my tiny bag, stowed my notebook computer and iPad in the truck, and had a quick lunch, I hit the road. I arrived in Houston, where my brother lives, sometime after six o’clock, making my way through heavy traffic to my niece’s house (where I would stay the night) before six-thirty. The two of us then went to pick up my brother and we went off to Tia Maria’s, where I treated them to a Tex-Mex dinner. After we’d dropped my brother off at his house and had returned to her house, we sat and chatted until her husband got home from work. He offered, and I accepted, some wine and we talked for an hour or so before going to bed; all of us had early days planned for Tuesday. I was up by 5:30 Tuesday morning. After thanking them for letting me stay the night, I picked up my brother and he directed me to a place called Jackie’s Kitchen, where we had breakfast. We were the first customers of the day; as we parked the car in front of the door to the place, a waitress inside looked out to see us coming and went to unlock the front door. After topping off the gas tank, we hit the road about 6:30, getting on I-10 heading west. In San Antonio, we left I-10 for US-90 west, driving through Castroville, Hondo, D’Hanis, Sabinal, Uvalde and Bracketville before stopping in Del Rio for gas and lunch at a Whataburger. From there, we continued on US-90 over the Amistad Reservoir, which looked feeble and nearly-empty. Along the way, we stopped occasionally at picnic areas to soak in the changing scenery. 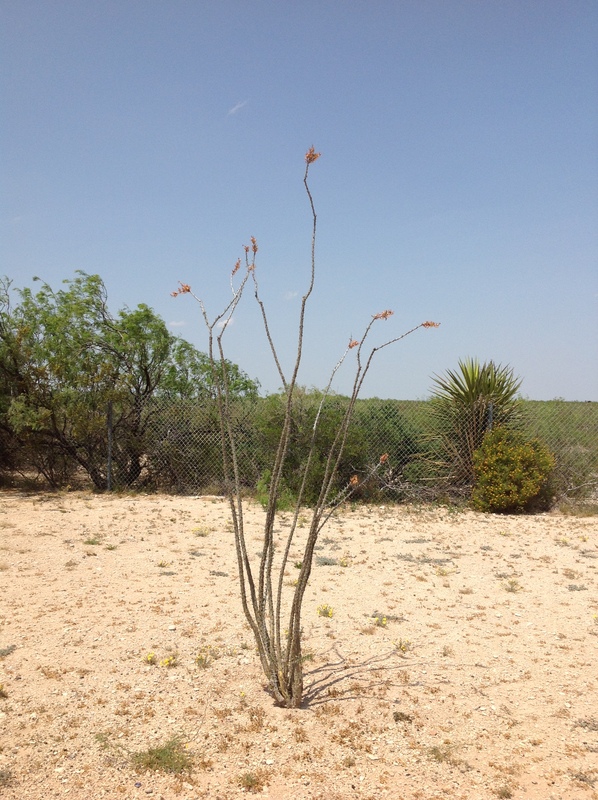 The image to the right is an ocotillo plant, one of hundreds and hundreds we saw along the side of the road and across the expanse of desert on both sides of the road for as far as we could see. The next town of any consequence, but not much, was Sanderson, then Marathon and, finally, Alpine. 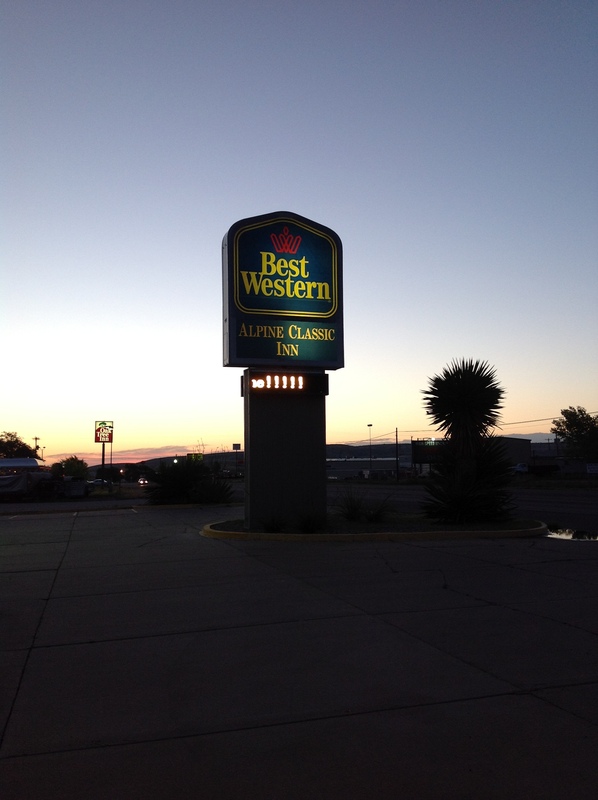 We checked into the Best Western Alpine at about 4:45 pm. 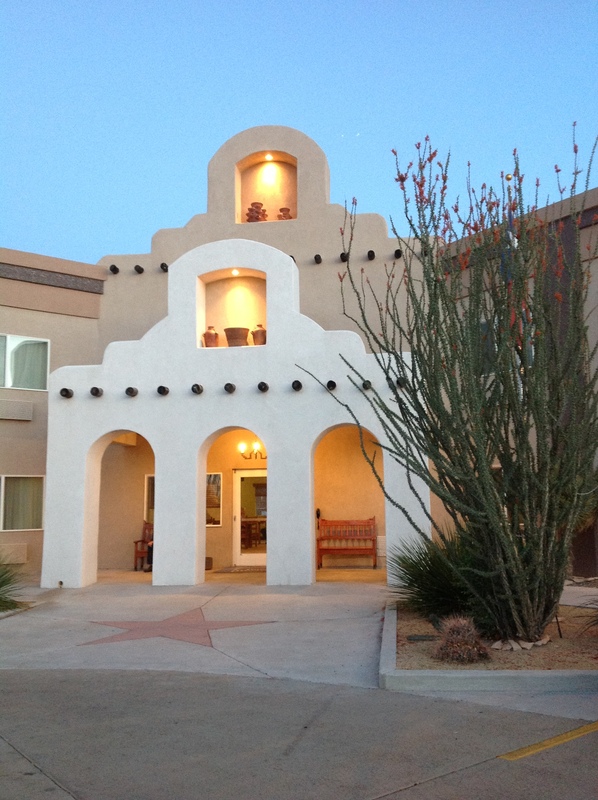 The Best Western looked very nice; I was impressed by the looks of the place. Almost immediately after we got there, my brother started feeling ill with a bad cold. He looked and sounded miserable and said he just needed to try to sleep. That didn’t work and he said he wished he remembered what sort of decongestant he could take with his high blood pressure. Thanks to a phone call and text message to our niece back in Houston, we learned that Musinex was the thing, so just after 6:00 pm I left the hotel in search of a pharmacy, only to find that pharmacies in Alpine close at 6:00 pm. I found a Family Dollar, though, that carried the stuff…at a cost of $11…and took it back to my brother. He did not feel like going out for dinner, so I went out to one of the few take-out places I could find, a Pizza Hut, and ordered a pizza for dinner. I ate my half and left his in the box, figuring he would at some point wake up hungry. We discarded the other half of the pizza the next morning. The Musinex worked overnight. By morning, my brother felt much better, so we ate the free breakfast buffet in the motel. Before we hit the road again, we spent a few minutes outside, soaking in the cool morning air and appreciating the quiet of the hotel, sitting right on US-90; there was almost no traffic passing by the place early in the morning. The overcast skies the night before prevented me from seeing the brilliant west Texas star scenery, but the early morning quietude and the clear, crisp air almost made up for it. The plan for the day was just to wander, so we did. 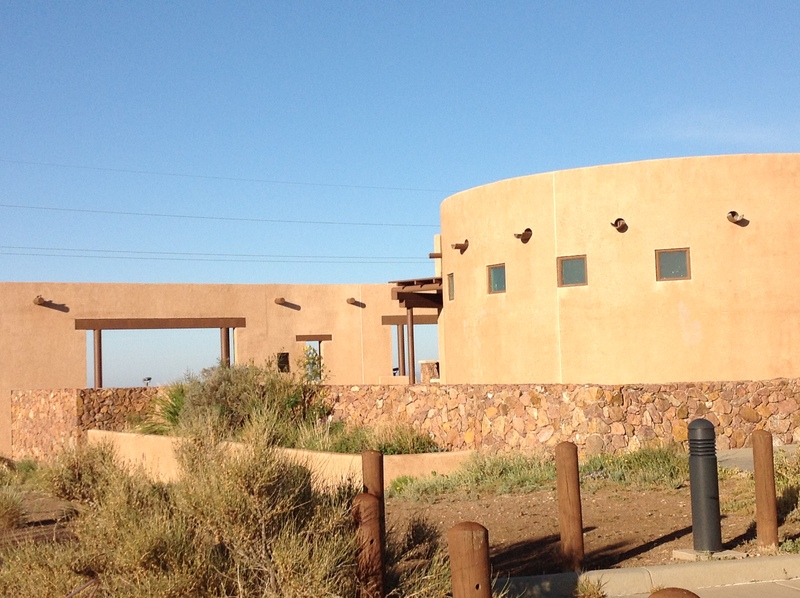 We headed first toward Marfa, where we could see first hand what all the “fuss” was about. My biases were in full form as we headed west; I expected to see a town that was too “taken” with its quirkiness and upscale attitudes for my liking. On the road west, we stopped at the place we had planned to go the night before, except for my brother’s bad cold and the cloudy skies: the Marfa Mystery Lights Viewing Area. Even without darkness and absent any chance of seeing the mystery lights, the place was intriguing. Empty and deserted except for huge numbers of swallows darting in and out of the restrooms and zipping across the sky all around, the viewing area was an attracting, welcoming little place alongside the road. 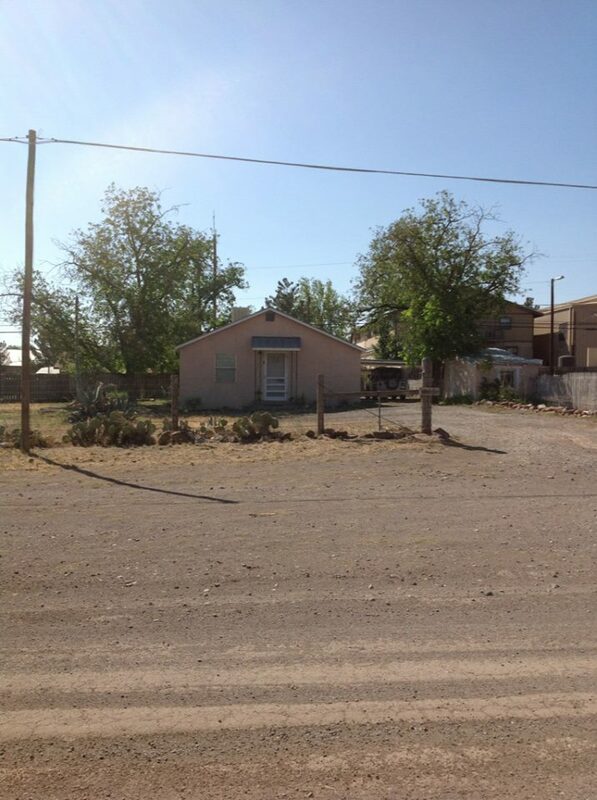 Once in Marfa, I changed my mind about the place and its people. What I had imagined would be an arrogant little outpost of well-off people who were completely oblivious to the incongruity between their lifestyle and the dry desert in which they lived was, instead, a beautiful little place. I was too engrossed in looking at the place to take many pictures, and none I took did any justice to the place. Suffice it to say I was impressed with the tiny little place, a town of only 2100 people, just a third of the size of Alpine. I took the photo of the courthouse before I got so engrossed in looking at the interesting houses, artist workshops, and other attractive architecture of the town. I changed my mind about Marfa; the people there aren’t entirely crazy and arrogant after all, I decided without having spoken to a single person in the town…the same way I had earlier decided they were all people I would have no interest in knowing. 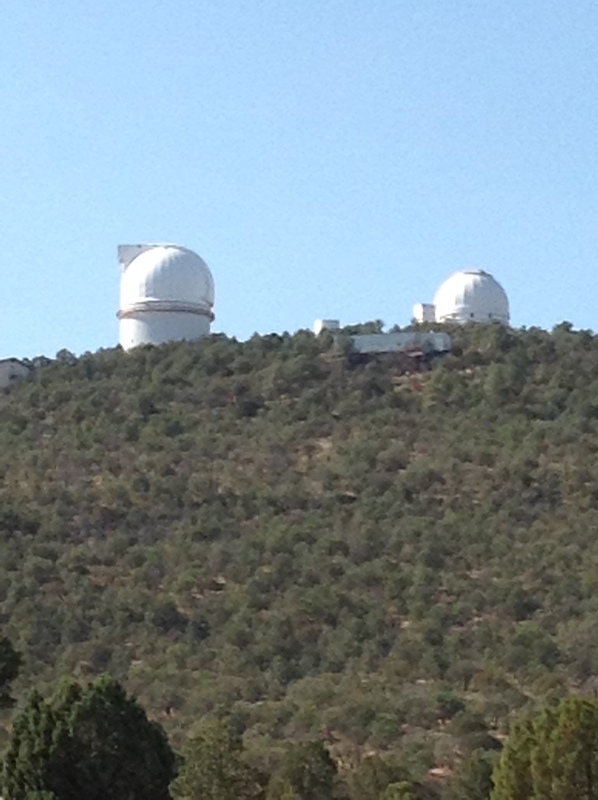 Next, we decided, we’d head toward Fort Davis and the McDonald Observatory. 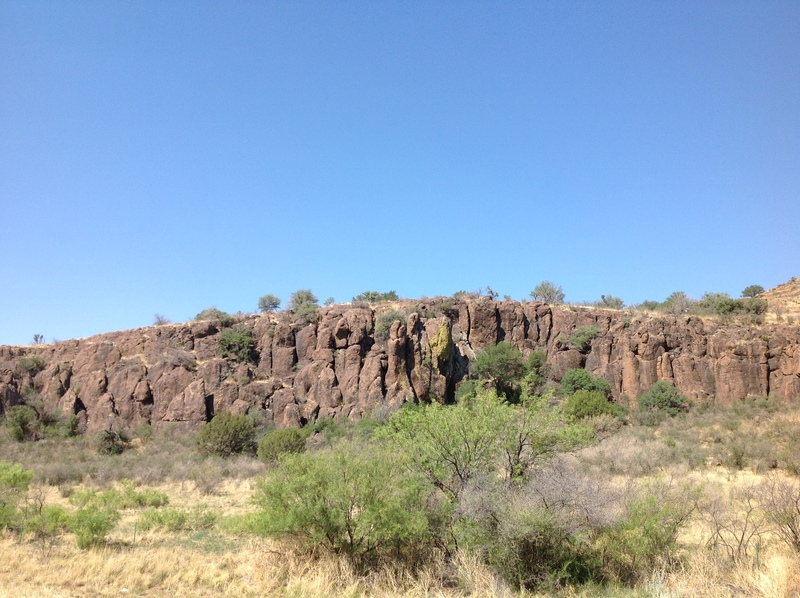 Along the way, we passed enormous rock outcroppings. These were unlike the horizontal layers of exposed rock I’d seen up until that point; these were massive vertical towers of rock worn smooth by time and weather and, perhaps, tides over many millennia. We wandered around Fort Davis for a while, hoping to find the house that my blogger and Facebook friend Ellie and her husband had lived in for a time during their seven-year odyssey around the country. I had no idea of the address and only a vague memory of a photo she had posted to her blog to give me an idea of what the place looked like. Just about the time I was ready to give up the search, there it was; I was sure of it! I took a photo and posted it to Facebook; Ellie confirmed that I had, indeed, found the right house. Fort Davis is a small town, with a population of about 1200, but it has a lot of “drive-by appeal.” There are several shops and other businesses along the main street and there’s a library on the east side of Highway 17 at the south end of town. 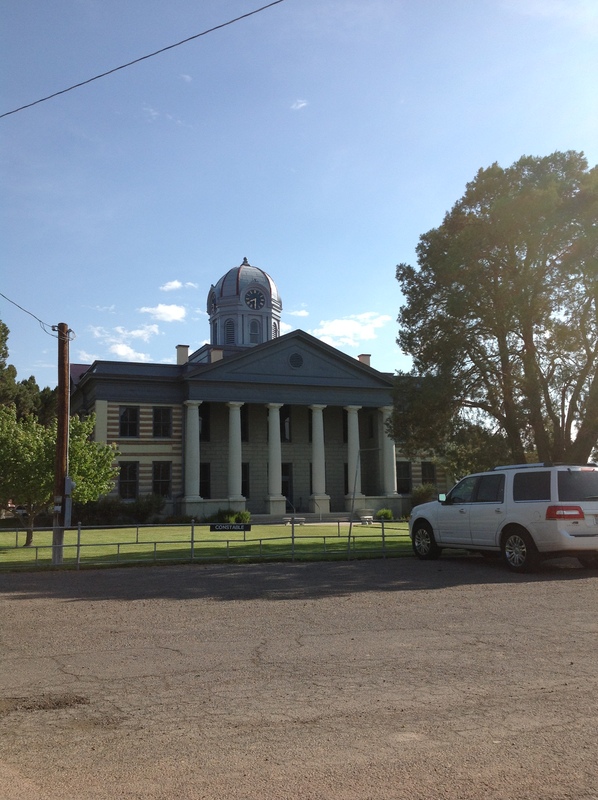 There’s an attractive courthouse, as well. From Fort Davis, we headed up to the McDonald Observatory, which is just a few miles up Highway 118, which has more than its fair share of switchbacks. We didn’t go into the visitors center, again because of my brother’s knees, but we got a good look at the observatory from the visitors center parking area. After going back into Fort Davis for another drive around, we got back on Highway 17 heading northeast, toward Balmorhea, where we got on Interstate 10 east. By the time we got to Fort Stockton, about 55 miles from Balmoreah, it was time to stop for lunch. We spied a little Tex-Mex restaurant that looked promising, so we stopped there. It was decent, if not outstanding, and it quelled our hunger. 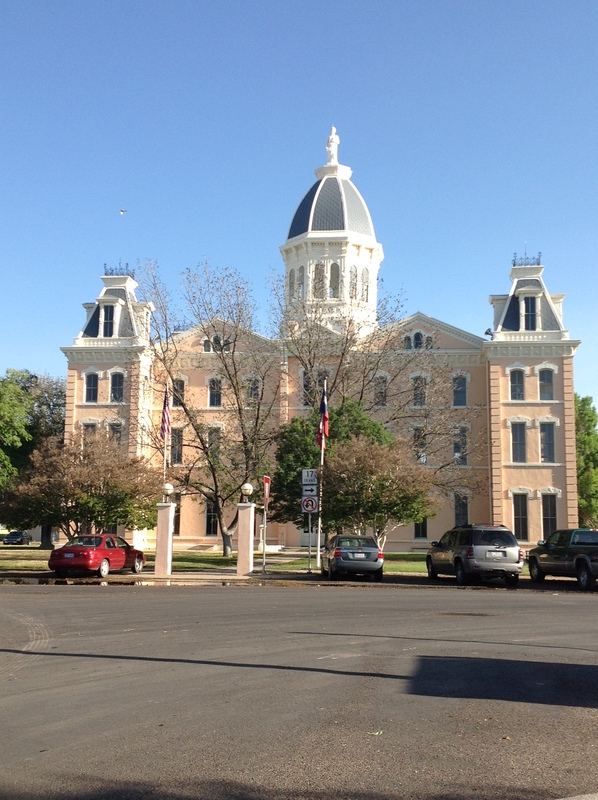 Once on I-10, we made good time getting to Kerrville, about 250 miles from Fort Stockton. Though it was relatively early, only about 4 pm, we decided to stop for the day. I picked another Best Western just off the interstate. The next day, we took Highway 39 west out of Kerrville through Ingram and Hunt. The highway parallels the Guadalupe River for quiet a way and criss-crosses the river in several places. It’s a beautiful, serene road. For reasons unbeknownst to me, though, I took no photos; I guess I was just wrapped up in seeing it and not thinking about preserving the memory in photos. Highway 39 runs into Highway 41, which in turn runs into Interstate 10 about 25 miles west of Kerrville. We took the road we had traveled the day before and got off at Kerrville again for gas, then got on Highway 16 toward Fredericksberg, then took Highway 290 to Austin, then Highway 71 to Columbus, where we got back on I-1o to Houston. I dropped my brother off at his place, then headed northeast on Highway 290 to Highway 6, then north to Bryan-College Station, then wandered down a number of backroads to I-45. From there, I drove home to Dallas. I put 1887 miles on the rental car and spent $695 on the car, gas, food, and lodging. It was, indeed, a whirlwind trip, but one I’m glad I made. I’d like to do it again one day, but at a slower pace and with more time to stop and experience each interesting place along the way.